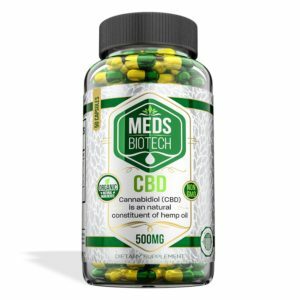 Meds Biotech capsules are pharmacist prepared cannabidiol Hemp oil capsules. These CBD capsules give you an easy to use consistent way of getting your daily CBD dose. These capsules contain all natural, organic and non-GMO Hemp oil that is CO2 extracted from pesticide free industrial Hemp. 10mg of CBD per capsule. 50 count. 500mg per bottle.